This program includes a forward written and read by Madeleine Albright, with a preface and introduction read by Stuart E. Eizenstat. The definitive history of the Carter Administration from the man who participated in its surprising number of accomplishments—drawing on his extensive and never-before-seen notes. Stuart E. Eizenstat was at Jimmy Carter’s side from his political rise in Georgia through four years in the White House, where he served as Chief Domestic Policy Adviser. He was directly involved in all domestic and economic decisions as well as in many foreign policy ones. Famous for the legal pads he took to every meeting, he draws on more than 7500 pages of notes and 350 interviews of all the major figures of the time, to write the comprehensive history of an underappreciated president—and to give an intimate view on how the presidency works. Eizenstat reveals the grueling negotiations behind Carter’s peace between Israel and Egypt, what led to the return of the Panama Canal, and how Carter made human rights a presidential imperative. He follows Carter’s passing of America’s first comprehensive energy policy, and his deregulation of the oil, gas, transportation, and communications industries. And he details the creation of the modern vice-presidency. Eizenstat also details Carter’s many missteps, including the Iranian Hostage Crisis, because Carter’s desire to do the right thing, not the political thing, often hurt him and alienated Congress. His willingness to tackle intractable problems, however, led to major, long-lasting accomplishments. This major work of history shows first-hand where Carter succeeded, where he failed, and how he set up many successes of later presidents. STUART E. EIZENSTAT was the chief White House domestic policy adviser to President Jimmy Carter and served as the United States Ambassador to the European Union from 1993 to 1996 and as the United States Deputy Secretary of the Treasury from 1999 to 2001. Stuart is the author of Imperfect Justice and President Carter. "Stuart Eizenstat has produced a knowing and insightful reassessment of President Carter's administration from the perspective of a clear-eyed insider. Based on his own experiences and hundreds of interviews, he shows how Carter's moral tone and under-appreciated accomplishments offer valuable lessons for our times. It's an important contribution to history." "'People never did understand me and still don't,' Jimmy Carter has said. Stuart Eizenstat disproves the claim in this ultimate insider's account of our 39th President, which does for Carter what Robert Sherwood did for FDR, and Ted Sorensen for JFK. His access equaled by his objectivity, Eizenstat places the first New Democrat in historical perspective as a self-confident moralist impatient with incrementalism, uncomfortable with Washington's status quo and the politicians who defer to it. Clearly more consequential, and legislatively successful, than it appears in popular memory, Carter's presidency put a lasting stamp on energy and environmental policy, human rights and the tortuous pursuit of peace in the Middle East. Eizenstat makes it all matter in this highly readable narrative forty years in the making, and well worth the wait." 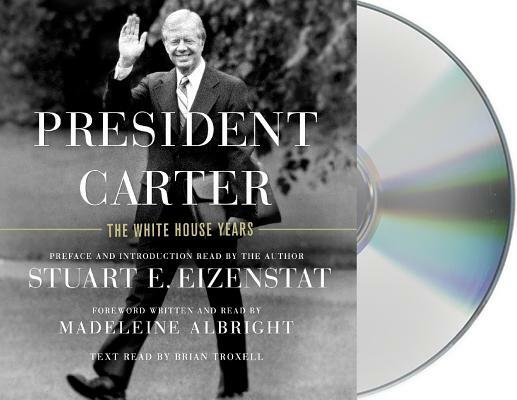 "Stuart Eizenstat's President Carter: The White House Years is an epic biography and first-class administrative history of our vastly underrated 39th president. Such Carter accomplishments as Camp David, the Panama Canal Treaty, Alaska Lands and formal recognition of China pile up in a dramatic fashion. The amount of new documentary evidence unearthed by Eizenstat is staggering. A landmark achievement!" "Jimmy Carter was one of the most intriguing, and often-times misunderstood, presidents in U.S. history. President Carter: The White House Years, written by Stuart Eizenstat, the Carter Administration’s chief domestic policy adviser, provides an in-depth and inside look at the successes and failures of our nation’s 39th President. It is a compelling read for all interested in this period of American history." "History may judge Jimmy Carter guilty of too much humanity, but he lacked neither courage, nor conviction, nor, in the final analysis, real and lasting achievements. This is an important and long overdue assessment." "Stuart Eizenstat has poured heart and soul, reams of contemporaneous notes, lengthy interviews, and personal reflections into the definitive saga of Jimmy Carter’s presidency, with all its shining promise of a new beginning to its ultimate disappointment in the sands of the Middle East. I’m glad he has done so. It’s a fascinating read about life in the White House, day by day, week by week, called upon to respond to crises domestic and international, all complicated by political differences in the President’s own party....Eizenstat’s research and recollections remind us that the 'man from Georgia' was also a man of principle and substance, with substantial accomplishments in office." "An admiring but also very frank account of Jimmy Carter’s presidency by the ultimate insider, Stuart Eizenstat. He’s honest about Carter’s weaknesses, as well as his strengths, and he reveals some details that have never been reported before. His summation of 'what ifs' at the end of the book makes haunting reading. This memoir reminds us that during the Carter years, we had a smart, decent but unlucky man in the Oval Office." “President Carter is an extraordinary reassessment of the first ‘New Democrat's’ presidency, combining Stu's recognized domestic and international policy range and depth with wonderful political, personal, institutional, and societal insights. This book is much more than a well-written and researched history: Stu reminds that Jimmy Carter was the first modern president who ran as an anti-Establishment populist, navigating currents of alienation that have continued to swirl around American politics." "Jimmy Carter may well be due for a revisionist wave. If so, Stu Eizenstat's important book will be seen as its cutting edge. As anyone who knows him would expect, Eizenstat’s book is tough-minded, thorough and thoughtful in making the case for a new view of the Carter Presidency. It deserves the close attention of anyone concerned with American history or politics." "With his President Carter: the White House Years, Stuart Eizenstat has delivered a masterpiece – presidential biography as it should be written. Eizenstat’s rich narrative is both endearing and unforgiving, tracking Carter from the earliest days on the campaign to his final, failed hours office trying to free Iranian hostages. The author delivers all the fly-on-the-wall authenticity of an insider, while at the same time providing the arms-length perspective and historical context of a skilled biographer. This groundbreaking book should prompt a reassessment of one of our least understood commanders-in-chief." "What better time than now for a reevaluation of Jimmy Carter’s presidency? And who better to initiate it than Stuart Eizenstat, Carter’s domestic policy director and one of his top advisors on the Mideast? No apologist, Eizenstat acknowledges Carter’s political weaknesses and studiously avoids excessive claims of greatness. President Carter is thus a first-rate work of analysis and history and a much-needed retrospective on a president who reflected great personal credit on the office he held and the country he served." "If you believe you know the full truth about the Presidency of Jimmy Carter, you’ll think twice after you read Stu Eizenstat’s fascinating, richly researched, insider accounts. Eizenstat has filled in a lot of blanks about the administration he loyally served. While he fully acknowledges major mistakes by Carter and his aides (including himself), the author makes a strong case that Carter’s four years in the Oval Office are due a serious reevaluation, and that Carter achieved far more than he is often credited with in the shorthand style of current history and commentary." "Stuart Eizenstat has written an important book, a richly detailed account of the events and people of Jimmy Carter’s presidency, which may very well lead to history’s reevaluation of the 39th President." "An unflinchingly honest, comprehensive description and analysis of Jimmy Carter’s presidency. Eizenstat’s reconstruction of Carter’s term offers detailed treatment of foreign and domestic policy issues, along with intriguing analysis of the politics of it all. He was a participant observer and activist who knew the players well. History benefits, as will scholars and other readers of this crisply written, carefully researched volume." "Stu makes it impossible not to see Carter’s genuine accomplishments at home and abroad and his daring to tackle problems others wouldn’t touch. It is a rare pleasure to read such a fair-minded and truthful book." "This book provides an important corrective to the history of the Carter administration. Written by one of the president's closest and most influential advisers, it portrays the intricacies of presidential politics in compelling, balanced, and extremely readable prose. The discussion of events leading up to and through the Camp David peace accords is fascinating."